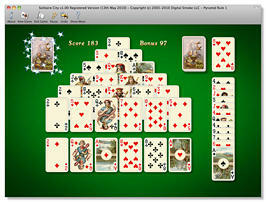 Download Here the Latest Free Trial Version of the Solitaire City card games for Macintosh. Try out the game for FREE for a limited time. Buy a Registration Key and play as long as you like. Includes unlimited free upgrades ! Updates are free. If you bought Solitaire City through Apple's Mac App Store then DO NOT download updates from this website. Instead, use the Mac App Store to update to the latest version. If you used this website to buy a Registration Key from BMT Micro then simply use the above link to download the latest Trial Version and install it over your Registered Version and it will unlock automatically. If you have problems installing Solitaire City or it doesn't work correctly on your computer then click here to submit a bug report form.